What's the difference between one certificate and another? According to Claire Santry's Irish Genealogy News blog the new collection will be included in Findmypast's Ireland and World subscriptions, and I have now been able to confirm this with Findmypast. Since the subscription prices are going up by around 20% on 16th February you might need to act quickly! At current exchange rates the Australian site offers the cheapest World subscriptions. Tip: by using the links above you'll be supporting LostCousins - and you might also benefit from a last-minute offer. There are over 4.6 million records in Findmypast's new Norfolk collection - the indexed transcriptions are linked to digitised images of the parish register entries. Findmypast have made available a list of parishes which shows the number of entries and years of coverage - you can view it here. As my Calver ancestors lived not far from the border between Suffolk and Norfolk, and in a village bisected by the toll road from Bury St Edmunds to Scole (on the Norfolk border), it wouldn't surprise me if I discover one day that some of my ancestors came from Norfolk - though searching the Norfolk records hasn't yet knocked down any of my 'brick walls'. 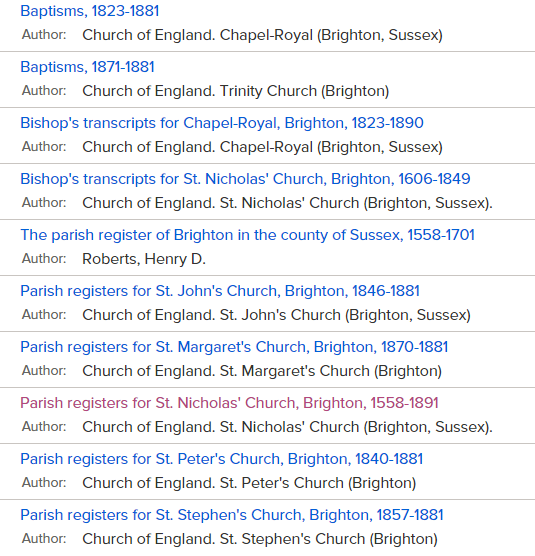 At FamilySearch there is a much smaller collection of entries from Norfolk registers, but you will also find Bishop's Transcripts and Registers of Electors, neither of which are available at Findmypast. The Genealogist also has parish register images licensed from the Norfolk Record Office (this is first example I can recall of a non-exclusive licence). 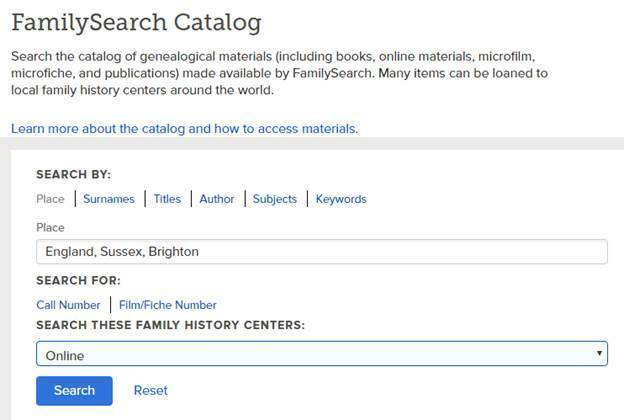 One of the 54 English record collections at FamilySearch is England, Sussex, Parish Registers, 1538-1910 - but whilst there are over 770,000 records in the collection, there are no links to images of the register entries. That means a trip to the record office if an entry seems to be missing or mistranscribed - or does it? Note the icons at the right - the camera icon indicates that there are online images. All I had to do now was click it and navigate to the right register page - which I did by trial and error, quickly arriving at image 95 (out of 532), where I found the marriage on 13th May 1866 of William James Lemmon to Harriet Calver. As it happens I already have the marriage certificate, which I purchased from the General Register Office many years ago - but of course the GRO registers are transcribed copies of the originals, so this was the first time I'd seen my great-great aunt Harriet's child-like handwriting (though she was 25 when she married). I also saw the signatures of the witnesses, spotting almost immediately that the first witness, whose name had been transcribed in the GRO register as S Harncombe, was actually T Farncombe. This might not sound particularly significant to you, but it enabled me to tentatively identify him as Thomas Farncombe, shown as a 27 year-old grocer's warehouseman on the 1871 Census - and, as William James Lemmon is shown as a grocer's porter 1871, I could then surmise that he and Thomas had been work colleagues - and possibly still were. Tip: if you have Sussex ancestors I suggest you make use of this wonderful resource while you can - should it transpire that we're not officially supposed to have access to these images they could disappear without warning. My guess is that there are many more records in the image collection than have been transcribed so far. That story from my tree reminded me that it's a long time since I've written about the differences between certificates ordered from the GRO, and those provided by local register offices. Note: this article is, like most of the articles in this newsletter, based on my experience in England & Wales - but what I'm going to tell you might also apply in other countries with a similar system. "At the end of every quarter, registrars, Church of England clergy, Secretaries of Synagogues and Quaker Registering Officers were required to make copies of every event they had registered during the period, or a nil return if there were no entries. These were sent to Somerset House where an army of clerks would abstract the names and prepare the index pages that were bound into volumes and placed on the search-room shelves." When you order a certificate from the GRO you will usually - though not always - receive a facsimile of the register entry, but the handwriting you'll see will typically be that of the local registrar, or the vicar who performed the marriage. You won't always receive a facsimile from the GRO - sometimes the quality of the microfilm image is so poor that they are obliged to produce a typed or printed copy, and this offers an additional opportunity for discrepancies to arise (since the clerk might misread the names). For example, in March 2003 I received from the GRO a typed copy of the entry for my great-great-grandparents' marriage in 1858 which gave the name of the first witness as Thomas Scatchman, a name that meant nothing to me. It was only when the 1851 England & Wales census went online in late 2005 and I discovered a Thomas Scotchman recorded as a visitor at my great-great-great grandparents' home in London's Shoreditch district that I got more interested in Thomas - the fact that he had turned up twice in my family records suggested that his relationship was closer than I had previously suspected, and I eventually discovered that my great-great-great aunt Eliza had married Thomas Scotchmer. Without that those clues I might never have discovered the right marriage for an Eliza Smith - especially in London, at that time the most populous city the world had ever known. Certificates ordered from a local register office may show the original handwriting, but not all register offices are able to produce facsimiles of the register entries, and some may do so only on request - always check before ordering. It is my hope that when the GRO revamps its service in the coming years it will be possible to order local certificates via the GRO website and using the GRO indexes (at the moment the GRO index references are meaningless to the local offices). However this is my hope, not the GRO's aspiration, so don't be surprised if it doesn't happen - nevertheless it would undoubtedly be a good way to protect the local register offices against the loss of income that might otherwise result from lower cost access to the BMD data held by the GRO. Helen Osborn, co-founder of Pharos Tutors, professional genealogist, and a long-time member of LostCousins is the author of Genealogy: Essential Research Methods, first published in 2012 but still extremely relevant. If you consider yourself to be a serious researcher, by which I mean someone who is interested in finding out the truth (rather than simply gathering together half-facts that appear to support your pet theories) then this book will remind you how it ought to be done. It isn't a book for outright beginners - if it were I wouldn't recommend it to LostCousins members, most of whom have been researching longer than I have - but it will be a valuable reminder for everyone else of what we ought to be doing. There's a big gulf between the techniques and standards that professional genealogists must comply with and the way that most amateurs like you and I work: for us it's a hobby, albeit one that we take very seriously, whereas the professionals have a duty to their clients. Yet it would be wrong to assume that it takes more time, more effort, and more expense to do the job properly - in fact, it's usually the other way round. I'm sure I'm not the only one who, having found a 'lost cousin', has had to re-do some of the research done a decade ago simply because I didn't note down all of my sources at the time. There's a 1953 country song which includes the line "I've forgotten more than you'll ever know", and this pretty much sums up the haphazard way some family historians work. By contrast I want to be able to pass on my discoveries - not by posting a public tree online for anyone to filch, but by corresponding with my cousins - and I would be letting myself down as well as them if I didn't document my research properly. Reading Helen's book has inspired me to do better in future. Like many of you, I'll never be perfect - I could certainly never be a professional genealogist, but that doesn't mean I have to behave like a complete amateur. If you share my aspirations you should read this book - and if you don't you should read it anyway, because the chances are it will change your mind. Available as a hardback, or as a Kindle download, this is a book that neatly complements Andrew Todd's Family History Nuts and Bolts: Problem-Solving through Family Reconstitution Techniques which I reviewed recently (indeed, that's one of the books that Helen recommends to her readers). Every graveyard offers that poignant contrast between dead remembered and the dead forgotten. This is beautifully expressed by Allen Sharp in his book A Green Tree in Geddes, in which he describes a Mexican cemetery divided into two such parts – the 'dead' whose graves are still visited, and commemorated with flowers placed there by the living; and the 'truly dead' whose graves are no longer maintained, their occupants no longer remembered by any living person. It is a stark metaphor for how everybody passes from memory to history. But there is an intriguing middle phase, perceptively identified by social historian Eric Hobsbawm in his notion that there are three phases in the process by which every human existence must glide imperceptibly out of the present and into the recesses of the past. In his first stage, evidence of a human life resides as personal knowledge in living human beings, memory that can never last beyond the longest lifetime of those that knew the deceased. The third stage exists as - ‘years beyond memory’, and is found within recorded history, whether written or pictorial. This is the absolute past, and very much the territory of the family historian. But Hobsbawm identifies an intermediate stage, recollection handed on, family memory and legend, which I like to call the ‘Twilight Zone’. Pure chance determines how far back this zone extends: perhaps no further than into the late 19th Century - my mother's grandmother Hannah Ratcliffe, after whom my daughter is named, died in 1887; her husband remarried and any family lore pertaining to her ancestry seems to have died with her. But in other families, the Twilight Zone can reach back centuries. The quotation at the start of this piece, cited by Hobsbawm, refers to Oliver Cromwell, who died in 1658. The 1923 speaker, born in 1832, had been 91 at the time of the remark, and had married at the age of 16 to an 80 year old man. He too had married at 16, in 1784, to an 82 year old widow. Her first marriage had been in 1720, to an 80 year old who had been in Cromwell’s service. Here is remarkable evidence of how extensive the Twilight Zone can be, and how close, in lifetimes, we are even to remote events - just five adult lifespans away from the English Civil War. There is an important distinction to be made between unproven and proven Twilight Zone material! Someone I knew repeated a family legend of a connection with the Sarah Jennings, wife of John Churchill, first Duke of Marlborough. Similarly, a particularly rebellious boy at my school claimed descent from Sir Thomas Wyatt, famously beheaded for rebellion in 1556! But neither story had been confirmed by research. It would be interesting to hear contributions to this newsletter from researchers able to confirm Twilight Zones in their own families which reached back beyond the usual few generations. This is the material that can really matter, and yet it relies upon human memory. And human memory is dying every second. If we think back to those two halves of the Mexican graveyard, the death of a very old person also causes the deaths of many others, for the dead person takes them along: anybody who is remembered by no one else becomes, at that moment, 'truly dead'. So, the speed with which most family history researchers rush into the absolute past of Hobsbawm's third stage, those 'years beyond memory', is a major mistake. All the principal sources for this stage are now infinitely more accessible in digital format than they were just 20 years ago. How much better it will all be in another 20 years! Why not let time solve your research problems in the absolute past? But perhaps far more importantly, each time a relative dies, some other segment of your family history becomes 'truly dead' and therefore reliant upon the unlikely possibility that some record of it may have been created in those years beyond memory. Ironically, confirming relational connections within the very recent past will be the major stumbling blocks for family historians of the future. To take one example, in barely half a century, marriage has changed from a near universal pre-requisite for having children in this country to being the choice for perhaps only 50% of childbearing couples. Post-1837 records of marriage are often the only link between a childbearing couple and their respective ancestries. The late 20th Century onwards could be a veritable desert for future family history research, and this is why the Lost Cousins website will perform such an important function. Focusing on connections four or five generations back through the 1881 census returns, it straddles the Twilight Zones of virtually every family. Note: you can re-read my review of Andrew Todd's excellent book here; I have a few copies available for anyone overseas who has had a problem getting hold of it. Andrew Todd's thought-provoking article reminded me a problem that bedevils most of us - the challenge of unidentified relatives in old photographs. How can we identify somebody when the only people who would have known what they looked like are no longer alive? I spent a considerable amount of time with my late aunt and my late father going through the family photos that they had inherited, and noting on the back in pencil who the people were (in the case of group photos, such as wedding photos, I made a photocopy and annotated it). However, there are many ancestors who lived in the age of photography but whose photos haven't survived, at least in my line of the family. In some cases the cousins I've found have been able to fill gaps, but some images will inevitably turn up only after all the relatives who would have been able to identify the subjects have passed away. Wouldn't it be great if we could see what our older relatives can visualise? When will someone come up with a consumer version of the facial composite systems that police forces use? You'd be amazed how many people say that they "don't have time" to enter information on their My Ancestors page. Or are you, perhaps, one them? For others it's an hour from when they eventually overcame their inertia - or their fear. Or, for those members who joined a long time ago, when they realise that the entry process has been speeded up enormously over the years. Each relative entered from the English, Welsh, Scottish, or Irish censuses now has an arrow symbol ( ) alongside. Click the arrow and a census search will automatically be carried out, using Findmypast (England & Wales), Ancestry (Scotland), or the National Library of Ireland. You don't need a subscription to any of those sites, though you might have to log-in at Ancestry or Findmypast to see the search results (which will appear in a new browser tab). This makes it really quick and easy to confirm that you've got the census references right - because if you haven't you won't get any results at all, or if you do, they won't include your relatives. Tip: you can check a household at a time - you don't need to check each individual separately since all members of a household are recorded with the same references. It's also an opportunity to confirm that you've entered the correct data for your relatives - beginners often make the mistake of entering information that isn't shown in the census (even though the Add Ancestor form explains precisely what to do, so it's really hard to go wrong). But if you have made an error you don't have to start again from scratch - simply click your relative's name (on your My Ancestors page), make the change(s) and click Save. Easy-peasy! "The civilized soldier when shot recognizes that he is wounded and knows that the sooner he is attended to the sooner he will recover. He lies down on his stretcher and is taken off the field to his ambulance, where he is dressed or bandaged. Your fanatical barbarian, similarly wounded, continues to rush on, spear or sword in hand; and before you have the time to represent to him that his conduct is in flagrant violation of the understanding relative to the proper course for the wounded man to follow—he may have cut off your head". This is so reminiscent of Lance-Corporal Jones' comments about fuzzy wuzzies (his words, not mine) that it's hard to believe that the creators of Dad's Army weren't aware of it when they created the character! Coincidentally the new Dad's Army film came out this weekend, and I for one look forward to seeing the stellar cast attempting to achieve the impossible. Whilst I've no plans to review the film, I do plan to review the book In Search of the Real Dad's Army (about the Home Guard, not the TV series) in a future newsletter. Two years ago I reported that the Red Cross was embarking on a project to digitise all of the index cards for WW1 volunteers - almost a quarter of a million of them. Those for volunteers with surnames from A to V are already online, but you'll also find many for surnames beginning with W - for example, I found this image of the card for Mrs H G Wells, wife of the famous author. I hadn't realised until then that H G Wells moved from London to Essex around the time he started writing The History of Mr Polly - living in a house that's just a few miles away from where LostCousins is now based. He rented Easton Glebe from Daisy Greville, the Countess of Warwick, who had been the mistress of the King Edward VII when he was Prince of Wales. Wells himself had several affairs, one of which was with Amber Reeves, daughter of Maud Pember Reeves whose Round About a Pound a Week is one of the best non-fiction books I've ever read (it records the poverty in the Lambeth area of London in the years leading up to the Great War). This blog article suggests that The History of Mr Polly was partly-inspired by the people and places of Colchester - it's certainly an interesting theory. Findmypast are in the process of digitising the largest online collection of US marriages in history. When complete it will include over 100 million records covering 360 years, and it is claimed that 60% of the records have never been published online before. You can already search 33 million records if you follow this link (though you'll need a US or World subscription to view them after 15th February). It seems that the death of Family Tree Maker was announced prematurely - the company which developed the Mac version for Ancestry has now agreed to continue developing and supporting both the Mac and the Windows versions. You can find out more about the new development here, on the Ancestry blog. If you're a Family Tree Maker user I hope you took my advice to delay taking any action following Ancestry's December announcement that they would be discontinuing support on 1st January 2017. 2016 is the 400th anniversary of William Shakespeare's death, and until 29th May his 1616 will and other documents from the National Archives will be on display at Somerset House in London - it's an opportunity to see no less than four examples of Shakespeare's rare signature. For more details of the exhibition By me,William Shakespeare: A Life In Writing follow this link. Mind you, it doesn't seem that long since we celebrated the 400th anniversary of Shakespeare's birth - I distinctly remember buying a First Day Cover with a Stratford-on-Avon postmark. However it turns out that it was 1964, when I was a spotty teenager and, to be scrupulously accurate, it was the 400th anniversary of his baptism - his precise date of birth is not known (any more than it is for most of our ancestors). By the way, the registers for Stratford-upon-Avon are not held at Warwickshire County Record Office, but at the Shakespeare Birthplace Trust Record Office . If you follow this link you can see the handwritten entry for William Shakespeare's baptism on 26th April 1564 - but what you're seeing isn't, in fact, the original entry or the original register. Although parish registers were introduced in 1538 by order of Thomas Cromwell, the Vicar General, it was not until 1598 that clergy were required to use parchment, and the contents of many of the early registers - including those for Stratford-upon-Avon - had to be copied into more durable books. Whether or not the original records were kept they certainly haven't survived, so we have to rely on the late 16th century copies. Another type of copy was also introduced in 1598 - Bishop's Transcripts were contemporary copies of register entries that were sent annually to the diocesan office (they were supposed to be provided within one month of Easter). Where the original registers have been lost or destroyed Bishop's Transcripts are invaluable. Because Bishop's Transcripts were sent to the diocesan office, the county record office which now holds them might not be the one you'd expect - for example, many of the BTs for Cornwall are held by Devon, because until 1876 both counties were in the Diocese of Exeter. So who holds the Rutland registers, and will they be going online? It turns out that the registers are on permanent loan to Leicestershire Record Office, which has contracted with Findmypast to digitise their collection of Leicestershire parish registers (as you can see from this Tweet, which originated from the record office). However, it appears from the tender document that the Rutland registers may not be included in this contract, since it refers to records "belonging to Leicestershire County Council". UPDATE: I've now heard that the Rutland registers will be included. I couldn't help being reminded of the Orson Welles classic The Third Man when I read about the woman who turned up at her own funeral - did you see it? I found the story here on the Independent website, but it was previously published in the Washington Post. Were you shocked by the news report which alleged that Age UK had profited by selling poor value energy deals to senior citizens? I'm afraid I wasn't in the least surprised - some years ago, when I was looking for a stair-lift for my late father, the quote I got from them was far more than we eventually paid. Those of us who are "getting on a bit" have also been hit harder by ever lower interest rates, and in the UK there is no sign of them going up. You'll probably know from previous articles that, following recommendations from LostCousins members, I've invested much of my own spare cash with the best-known peer-to-peer lending companies, and I thought you'd like to know that you can now get a bonus of £100 when you open an account with peer-to-peer lending company Ratesetter on the recommendation of an existing member, then lend £1000 or more (if you use this link to join I'll also earn £50). What I like about Ratesetter is being able to lend for periods as short as one month - which means I'll be able to get my money back in time to pay for our new kitchen (when we eventually decide what we want!). I was a little surprised to note that in the past 2 weeks I haven't had to answer the phone once - though perhaps that's not surprising in these days of email, smartphones, and text messaging. That's not to say there haven't been any calls - there have, but they have all been unwanted calls. I sat down today and tallied them up - there were 12 in all, 5 of which were number 'withheld', 4 showed up as number 'unavailable', 2 had a number but they were bogus numbers (which looked real but had too few digits - this is the spammers' latest trick), and the other had an international number (in Spain, where we don't know anybody). As regular readers will know, I'm no longer troubled by unwanted calls because my BT8500 phone only rings when there's a call that I do want - and this ingenious device works whether or not the number is available, unlike the inferior models that preceded it. I think it's absolutely brilliant, and for under £40 for a single cordless phone with answering machine, or under £50 for a twinpack, it could be one of the best investments you'll ever make - just follow this link for the best price. The following paragraph was written after my wife proofread this newsletter, so apologies for any typos. Next Sunday is Valentine's Day - it's also my wedding anniversary, as well as the anniversary of the day my great-great-great grandparents married in 1809. So I was delighted to notice that until midnight tomorrow (Tuesday) I could save an EXTRA £3, £5 or £10 on perfume, aftershave and other cosmetics at AllBeauty - over and above their normal savings (which are often 50% or more). Delivery in the UK is free provided you spend at least £15, but they ship worldwide and can display prices in several major currencies. Finally, a cooking tip I discovered when cooking for guests this weekend. Rather than cooking a whole head of broccoli I decided to steam the florets and stir-fry the stem after slicing it into thin rounds - and it proved an inspired decision. On this occasion I stir-fried the sliced stem with cabbage, but if you have enough there's no reason why you couldn't cook it on its own. Many people compare the flavour of broccoli stems to asparagus - but on this showing I would say that broccoli is better. I do hope you'll try it - broccoli is cheap, healthy, and delicious! I have now been able to confirm that the Irish Catholic Registers will be included in Findmypast's Ireland and World subscriptions - see above for links. That's all for this issue, but I'll be back soon with a lovely story about a 1927 adoption, a refresher on the 1939 Register, and much more besides.